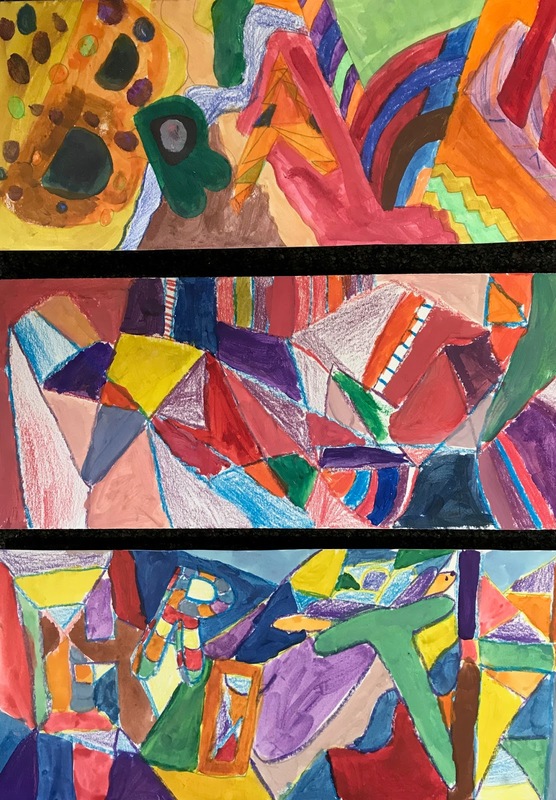 One of the very cool things about focusing on living artists in my curriculum is being able to meet some of the artists first hand and to develop relationships with them. 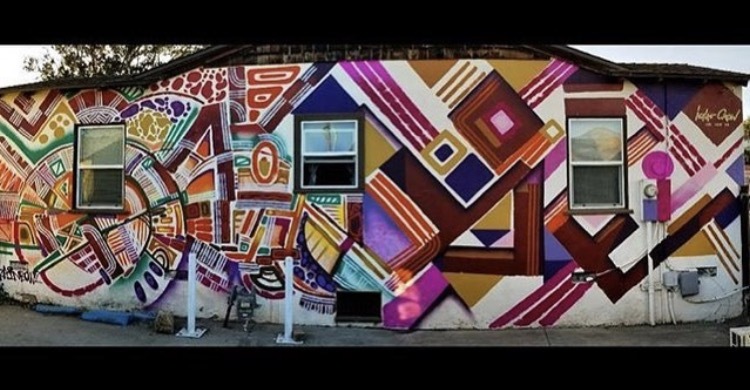 Case in point- and I have loved being able to share this with my students- a couple months ago, I discovered through instagram, that artist Isaias Crow was painting a collaborative mural with visiting artist Leon Rainbow, in my neighborhood. I recognized the house from the photo he posted and excitedly hustled down the street to check it out in person. Isaias, who is one of the kindest and most generous people out there, took time to talk to me (and then my wife when I brought her down, too). 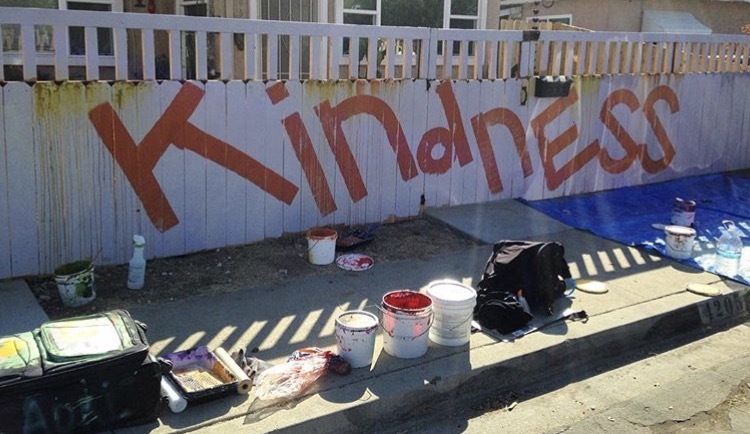 We suggested that if he ever needed another wall in the village to paint, that we had one. 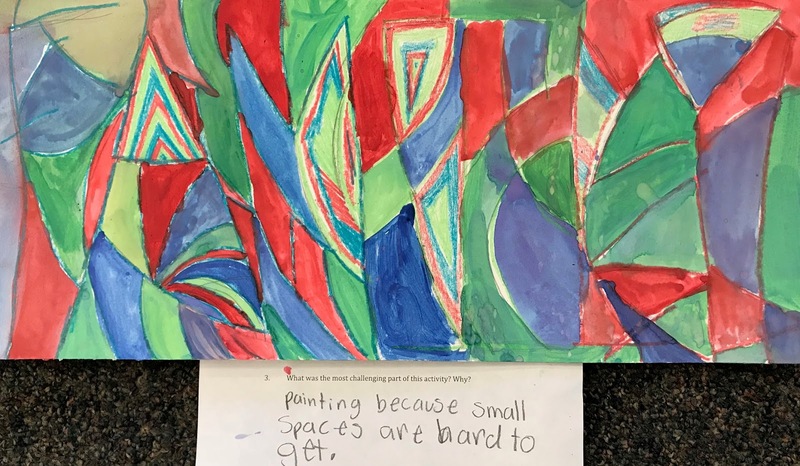 the mural that led to this design activity! the process of the intention murals. Fast forward a month and we were meeting with Isaias to participate in his Intention Mural series. He guided our family through several collaborative and reflective exercises and then we came up with a word to guide the mural process. We chose "now" because as a family we need to work on being more present with one another, and not detached with our focus on our various device screens. He came back on MLK day and led us through the mural process- he sprayed "now" on the side of our garage and my wife, 2 kids, and I took turns adding more lines to the wall in order to break it up and abstract the surface. Once that was complete, we used mural and house paint to fill in areas, changing and combining some of the shapes as we went. After lunch we finished the color work with a variety of spray paint colors. It was such a wonderful experience to be a part of. I got to play the role of student to his process and gaining experience with spray paint. As soon as the mural was complete, I knew I had to lead my students through a similar activity. 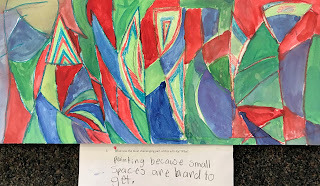 So, the 4th graders have been experimenting with paint technique, abstraction, and meaning in art while using Isaias' Intention process as the guide. After looking at several of his intention murals, including ours, I ask the students to write a list of 5 words that symbolize things that are important to them. They then narrow things down to 2 words and practice arranging them in long horizontal sketches. They can use bubble letters, block letters, upper, lowercase and they can spread them throughout the rectangle any way that occupies the space effectively. They then draw their word much larger and more lightly on an 8x16" sheet of watercolor paper. I model how they can extend lines to break up the background and how they can add more lines to echo letter parts of their chosen word. I emphasize that the word does not have to end up being readable to the viewer. Students can then choose a few crayon colors to use as their crayon resist. They can use the crayons to trace pencil lines to trap paint colors and they can use crayons to fill sections. I suggest half crayon, half tempera paint. When filling shapes with crayon, I encourage students to experiment with hand pressure to create light and dark color values. 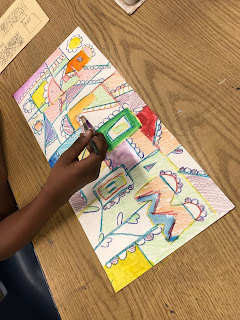 When they move on to painting, the color choices are theirs to make- they can be similar to the crayon colors or they can contrast against those colors. 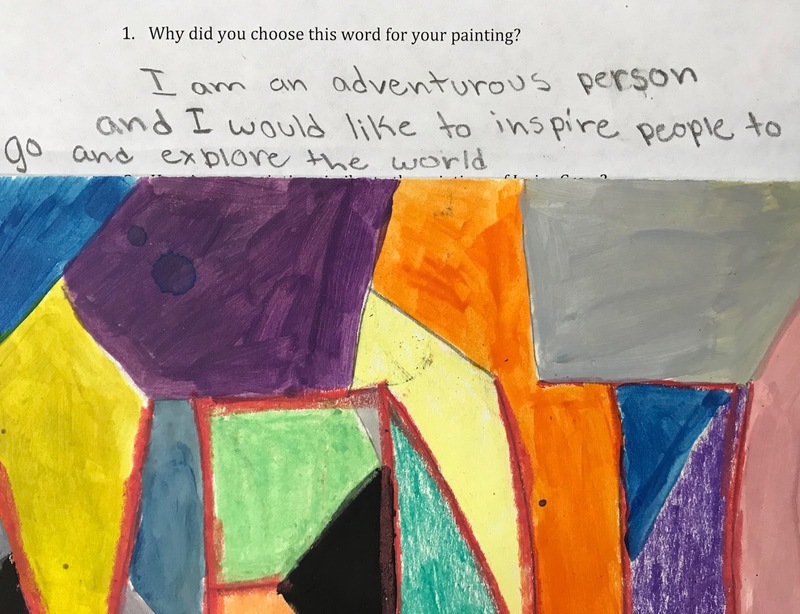 The final step is to complete an exit slip that asks students to identify why they chose that particular word. It also gets them to compare their work to Isaias's and to reflect on the most challenging part of the whole process. 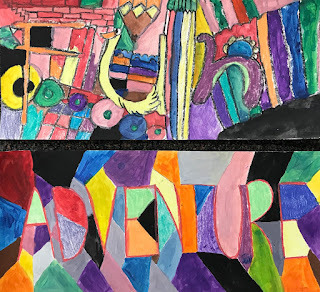 The kids have been super engaged with this activity and many students have been coming in at morning recess AND lunch recess throughout the week to continue working. The art room has been buzzing with creative energy all week long! 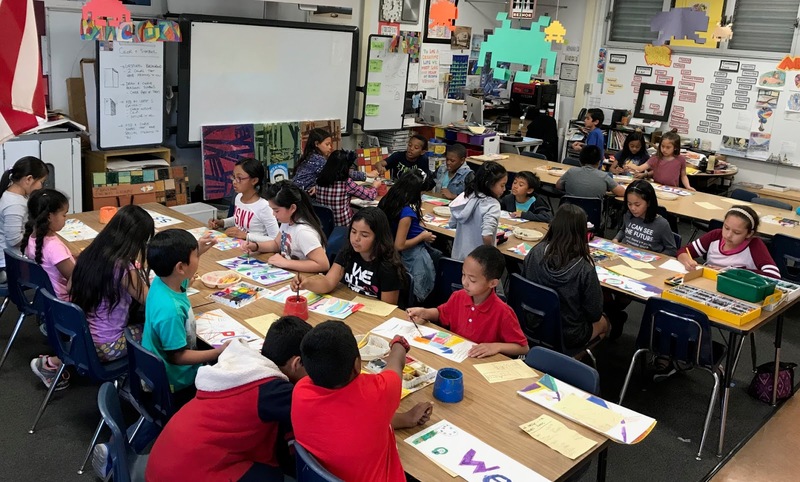 the art room has been HOPPING at recess! I love looking through your work to give me inspiration...I always find something! I am interested in involving my elementary students in generating ideas for a mural at our school that focuses on a word they connect with Rosa Parks (our school namesake). 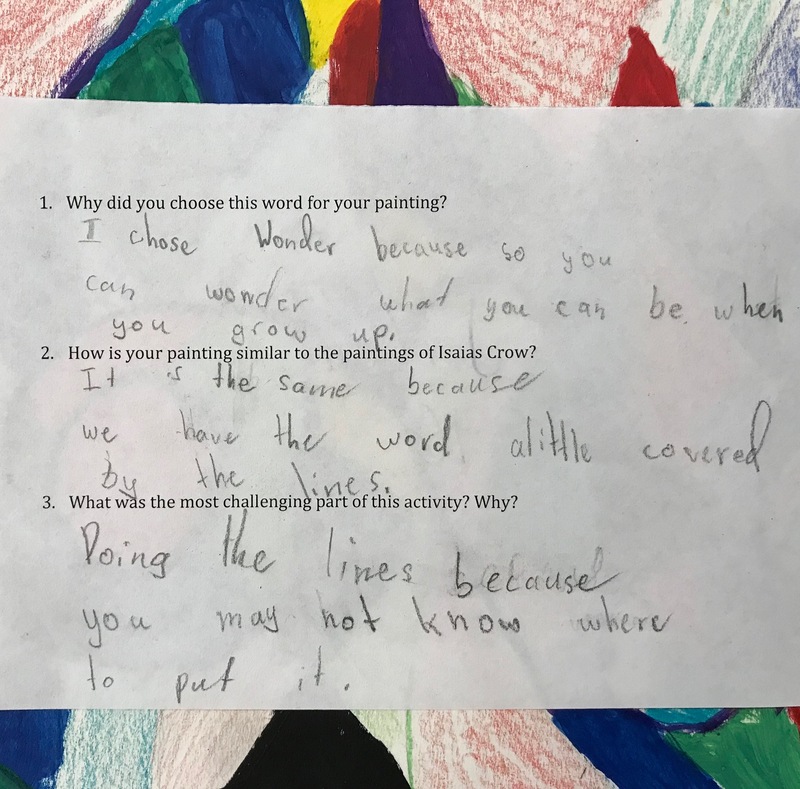 What intentional activities did you do with Crow and your family that evolved into your mural? Thank you!